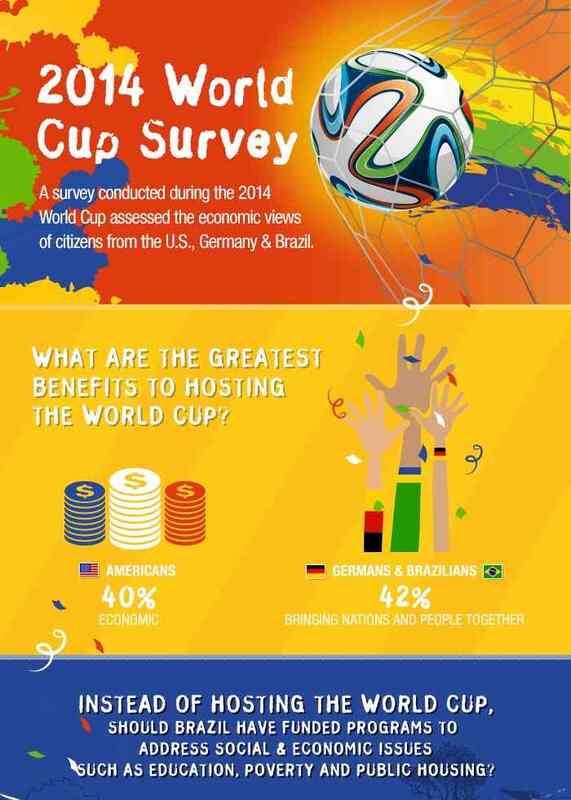 QuestionPro, Inc., an online survey software provider, released the results of its 2014 World Cup survey. Americans, Germans and Brazilians were surveyed on their attitudes toward the 2014 World Cup in relation to Brazil’s infrastructure and economy. When asked their opinion on the greatest benefit of the World Cup, Americans most commonly answered “economic” (40% of Americans surveyed), as opposed to Germans and Brazilians who most commonly cited “bringing nations and people together” (42% of Germans and Brazilians). Americans were also less supportive of funding social programs as an alternative to the $11B Brazil spent on hosting the World Cup. When asked whether or not Brazil should have diverted some funds toward social programs such as education and housing, only 50% of Americans felt Brazil should have spent funds on social programs, as opposed to 74% of Germans and 65% of Brazilians. Additionally, given the costs, only 50% of Brazilians surveyed felt that Brazil should have hosted the World Cup at all.